Did you forget your password and cannot remember what it was at all? Don’t worry, there is a very easy way to recover your account and reset DeviantArt Password. 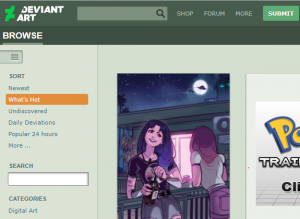 If you remember some of the information you entered while making your DeviantArt account, then you can very easily reset the password of your account. Firstly, open the DeviantArt website. You can also just click on the DeviantArt which will directly take you to the website. Click on the Login button in the top right corner of the website. Now you will see the phrase “Forgot Password or Username?” Click on the phrase. Now you will see two options: I forgot my Password and I forgot my Username. Click on I forgot my password button. Now, enter your unique Username. Then, click on Recover Password button. This will send a verification code to the e-mail address that you used to create your DeviantArt account. Open your e-mail account and open the mail sent by DeviantArt. Now you can enter a new password for the account. Re-enter the exact same password in the next box as well. Now you can use your account using your previous username and new password. Note: If you don’t have access to the e-mail address that you used to create the DeviantArt account then you can click on the phrase “I don’t have access to this email address” which will be shown after step no. 7. Now you can read the solutions provided by DeviantArt itself. If you don’t remember your Username as well then you can follow these process after the above step 4. Click on the “I forgot my Username” button. Now, enter the e-mail address that you used to create your DeviantArt account. Click on the “Recover Username” button. This will send your username to the e-mail address that you used to create your DeviantArt account. Open your e-mail account and open the mail sent by DeviantArt. There you will see the username that you have on your account. Now you can click on “reset your password” which is below your username. Now you can follow the above process from step 4. This entry was posted in Account Reset Password and tagged deviantart, Forgot DeviantArt Password, How to Recover DeviantArt Password, How to Reset DeviantArt Password, Recover DeviantArt Password, Reset DeviantArt Password on April 4, 2018 by jcgbyHvNvn.